If someone was not a football fan before last weekend, and they watched a little bit of the NFL’s Week 14 action , chances are they are now hooked. Week 14 was amazing and some of the best excitement was produced by NFL Regional Combine legends. Oakland Raiders wide receiver Seth Roberts may not be a big time wide out in the NFL, however, he is a big deal in Oakland. Roberts has came through for the Raiders on several occasions throughout his time in Silver and Black. Against the Pittsburgh Steelers, the standout from the RC 2014 trials was clutch again. With 1:59 left in regulation on first-and-10 from the Steelers’ 46-yard line, Raiders quarterback Derek Carr received the snap from shotgun formation. Carr checked to his left, turned to face down the middle of the field and threw deep to Roberts, who ran a straight go route down the left hash marks. Double covered by Steelers safeties Morgan Burnett and Terrell Edmunds, Roberts extended his arms as he blew pass the defenders and the ball dropped into his hands for the perfect toss and catch. “I told Seth (Roberts), I think it was during the TV timeout or two-minute warning if I’m not mistaken,” said Carr, according to Raiders.com. “And I told him, ‘Seth if we get two high I know what you got, but just take the middle. And I’m going to try and pump it one way and I’m going to throw you the ball if it’s two high. Roberts’ reception set the Raiders up for a much needed touchdown to take the lead, which they earned four plays later. After a failed field goal attempt, the Raiders held on and cut into the Steelers postseason journey. Clearly, Roberts’ catch was the key for the eventual win. Roberts finished with five catches for 76 yards. The Denver Broncos have been on fire for three straight weeks with huge wins against future Hall of Fame quarterbacks in Philip Rivers and Ben Roethlisberger to stay alive for the postseason push. So, the San Francisco 49ers led by an undrafted quarterback in Nick Mullens should not be a problem, right? Well, Mullens and the 49ers did not get the memo of how important this matchup was for the Broncos. They just knew it was game day, and the Broncos had to go down. During the first half, it was clear that Mullens was on a mission, especially with tight end George Kittle being in the zone. “He (Kittle) was open every play, man. It was crazy. Shoot, all the receivers were,” said Mullens. “That’s why I give the coaches so much credit. The guys were wide open. So, that’s fun, man. The O-Line played great. They were protecting their butts off and we really just had a rhythm. Mullens targeted nine different players with Kittle leading the way with seven receptions for 210 yards and a touchdown. On third down situations, the 49ers did not settle with the run and allowed Mullens to throw darts to convert first downs with his arm. Mullens completed 20 out of 33 attempts for 332 yards and two touchdowns with an interception, which bounced off tight end Trent Taylor’s hands in the fourth quarter with 11:23 left. With Mullens’ 332 passing outing, he became the first undrafted 49ers’ quarterback to throw over 300 yards in consecutive contests since Jeff Garcia, who accomplished that feat in three consecutive games in 2000. Mullens also joins fellow undrafted talent, Broncos quarterback Case Keenum, as the only unknown gems to throw for 300-plus yards in consecutive weeks since the start of last season. Keenum did it in Weeks Five and Six. -Los Angeles Chargers linebacker Jatavis Brown finished with seven tackles against the Cincinnati Bengals. 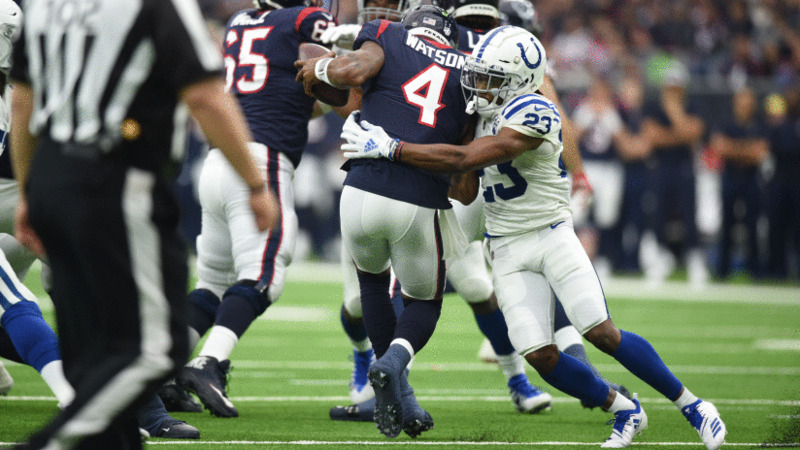 -Indianapolis Colts cornerback Kenny Moore II terrorized the Houston Texans for seven tackles, including a sack. In the first quarter with 9:04 remaining, Texans quarterback Deshaun Watson was in shotgun formation. At the snap, Moore came blitzing in and took Watson down for a nine yard loss.